How to delete an item of the personal "Startup" folder of a single user on Windows 7? On Windows 7 system, each item in the personal "Startup" folder of a user C:\Users\...\AppData\Roaming\Microsoft\Windows\Start Menu\Programs\Startup represents a startup program that applies to a single user on the system. "..." is the user login name on the system. 1. Go to the personal "Startup" folder, C:\Users\...\AppData\Roaming\Microsoft\Windows\Start Menu\Programs\Startup. If this folder is hidden on Windows Explorer, you can copy and paste the folder path into the folder path box. 2. Review items in the personal "Startup" folder. 3. 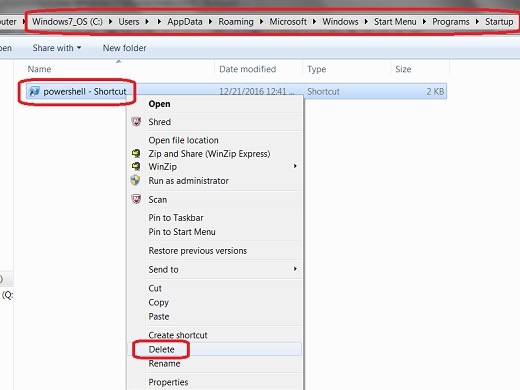 Right-mouse click on the item, "powershell - Shortcut" for example, you want to delete and select "Delete" from the context menu. The selected startup program will be deleted.